See what's happened at TCHS! Join us on Tuesday, Dec. 12th at 6:00pm. Meat will be provided, bring a covered dish, side, or dessert. The public is always welcome as we celebrate the holidays and the past year at the museum and historical society. At the Museum in the Fairchild-Knox Hay Barn. Open to the public. No charge. "Women Writers on the Santa Fe Trail"
A presentation and discussion by Leo E. Oliva on Tuesday, November 28 at 7:00 pm at Tonganoxie Museum, 201 West Washington Street, Tonganoxie, KS. Members of the community are invited to attend the free program, which is made possible by the Kansas Humanities Council. The program is one of the regular Fourth Tuesday programs hosted by the Tonganoxie Community Historical Society. Refreshments will follow the presentation. Some of the first women to travel across present day Kansas were travelers on the Santa Fe Trail. The presentation will look at the adventures and reflections of four women who wrote their own stories. One woman traveled with her husband's wagon train in 1846, while another traveled back and forth five times between the ages of 7 and 17. The most famous woman to be discussed, however, was Julia Archibald Holmes who later became the first women to climb Pike's Peak in Colorado. "Women who traveled the Santa Fe Trail provide a different perspective than men, with more intimate details about the environment, other travelers, and their own feelings," said Oliva. "Each of these four women had a unique experience. Their letters, diaries, and memoirs still inform and enchant us today." "Women Writers on the Santa Fe Trail" is part of the Kansas Humanities Council's Kansas Stories Speakers Bureau, featuring presentations and discussions that examine our shared human experience—our innovations, culture, heritage, and conflicts. The Kansas Humanities Council conducts and supports community-based programs, serves as a financial resource through an active grant-making program, and encourages Kansans to engage in the civic and cultural life of their communities. For more information about KHC programs contact the Kansas Humanities Council at 785/357-0359 or visit online at www.kansashumanities.org. "Exploring the Nooks and Crannies of Kansas"
Research duo to give program on new Kansas guidebook. Marci Penner and WenDee Rowe of the Kansas Sampler Foundation spent four years going to every one of the 626 incorporated cities in Kansas. The result or their research journey is The Kansas Guidebook 2 for Explorers. On Tuesday, November 28 at noon, Penner and Rowe will come to Tonganoxie. They will give a presentation, "Exploring the Nooks and Crannies of Kansas", at the Tonganoxie Community Historical Society, 201 W. Washington Street. There is no charge to attend the program and the event will include a light lunch. "We will take the audience on a fun picture journey throughout the state sharing road trip ideas and telling stories about our adventures. From restaurant suggestions to art, architecture, history, geography and more, we'll give you a sampling of what to see in Kansas and share tips on how to explore." 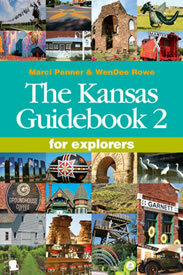 After the program, the co-authors will sign and sell the Kansas Guidebook 2 for explorers at the museum. The 480-page, coil-bound book is chock full of information that can be used to plan Kansas road trips. Along with 4,500 entries that provide descriptions, directions, hours, and contact information, there are more than 1,600 color pictures. Rowe says, "Many people will be interested in the 843 restaurants, cafes, drive-in's, and soda fountains!" 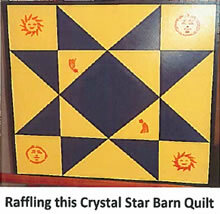 The book is designed to help achieve the Foundation mission to preserve and sustain rural culture. Penner says, "Though the book reads like a travel guide, it's intended to help people get to know the state and learn about towns of every size." Among the diverse entries, guidebook users will find historic bridges, beautiful statues, specialty shops, quirky sites, little known points-of-interest, cemetery finds, bike trails and backroad scenic drives statewide. Rowe said, "There really is something for everyone whether you are looking for outdoor sites or ways to get to know a town." Find more information at kansassampler.org. The program is sponsored by the Tonganoxie Business Association, the Southern Leavenworth County Leadership Development Council, and the Tonganoxie Community Historical Society. The Historical Society will have a table and treats for the children of Tonganoxie during this annual event. Did you know that Quantrill lived in Lawrence for about 6 months? He lived in a hotel near the Kaw River. He used the name Charley Hart. Do you know the battle cry when Quantrill's men entered Lawrence? It was "Remember Osceola". James H. Lane had led men on September 22, 1861 into Osceola, Missouri, where they defeated a secessionist force, looted the town, liberated hundreds of slaves, and summarily executed nine locals. Of the 800 buildings in town, only three were spared from burning. Our program is a video recording of Harold Riehm's portrayal of Rev. Richard Cordley, the pastor of Plymouth Congregational Church, and an eyewitness of Quantrill's raid on Lawrence on August 21, 1863. Harold Riehm is well-known re-enactor in the Lawrence area. He is a retired political science professor from KU. This program is an in-depth study of Quantrill's raid on Lawrence and the events leading to this raid and what happened in Lawrence after the raid. Richard Cordley was born in Nottingham, England, but grew up in Michigan. He came to Lawrence and was pastor of the Plymouth Church from 1857 to 1875 and 1884 to 1904 when he died. Because Rev. Cordley was an outspoken abolitionist, he was marked for death by the raiders, but he was able to avoid being seen or captured. But his house and all of its contents were burned. A few years later he wrote about this raid on Lawrence. He was an eyewitness to the destruction. Program will be held at the museum site in the Barn. As always, the public is welcome and the program is free. Popcorn will be served. "The Kramer Collection of Native Indian Artifacts"
Brad Logan, an archaeologist specializing in Great Plains archaeology, will present the program on the Kramer Artifacts – a collection of pre-historic arrows, points, stone tools, and pottery sherds – that was donated to the museum by Frank "Junior" and Barbara Kramer. The Kramers spent over 40 years collecting the pieces on their property just northwest of Tonganoxie. Brad Logan's program will coincide with the opening of this new exhibit. The collection of over 800 pieces was catalogued at K-State by students under the supervision of Dr. Logan. Join us for an evening of archaeology and stories of pre-historic people who lived and travelled through this area along the tributaries of the Kansas River long before the Kansa and Delaware people. Look for the TCHS booth and enjoy the festival. 1pm to 4pm on Sunday. The Tonganoxie Middle School History Club will present a program on their most recent field trip. For many years, Kathy Harrell has taken the history club students on a field trip to a wide variety of historical places and landmarks. Come join us to hear about the latest trip. TCHS Program at the Reno Methodist Church on the historical site. As always, the public is welcome and the program is free. Refreshments served after the program. There is no Fourth Tuesday program in July. We will plan to see you at the annual Leavenworth County Fair Parade on Tuesday July 25,2017 at 6:30pm. Look for the 1936 Fire Pumper Truck, which will be a part of the parade. The Historical Society will host its annual Picnic. The public is invited to attend – just bring a covered dish and a desire to visit with us and eat some great picnic fare. During the glory days of the soda fountain, Kansas pharmacists created tonics and curatives that eventually evolved into refreshments like the Brown Cow, the Mudslide, and the Egg Cream. Government regulations, World War I luxury taxes, and bottled soda pop played a role in these ice cream concoctions that became a profitable sideline business. The presentation will explore soda fountains in Kansas today and the revival of soda fountains throughout the nation. Cindy Higgins will present the program. She is a journalist and Kansas historian whose research interests focus on Kansas industry before technological mechanization dramatically changed work and labor in the early 20th century. The presentation is sponsored by the Kansas Humanities Council. Members bring an historical item from home on this night and share the story of that artifact or photo. There is never a dull moment at these programs, which have been popular TCHS since 1985. This program is totally home grown. Bring a treasure from home and join in the fun. We welcome any and all who enjoy the thrills of spring cleaning. "Using Music to Teach History"
Matt Beat, Tonganoxie High School History teacher, will share some of his techniques to teach history. He uses music and YouTube to get his students excited about history. Mark your calendars for a delicious lunch and dinner. Adults $7 - Children $4. Advance Tickets $6/$4. "Rescuing and Renovating the Little Stranger Church"
As always, the public is welcome and the program is free and followed by refreshments.